Today was a historic moment. Six intrepid trailblazers in the SECAG (South East Coastal Area Group) area, including for today only the honorary counties of Berkshire and Cumbria, met today in Merstham, Surrey, for the inaugural meet of the RMWeb modular standard to attempt to see whether a group of individuals, who have never met before, working to the standards discussed and defined earlier in the year, could successfully meet and, having likely misinterpreted or loosely applied the rules in a number of different ways, join their various modules together and successfully run trains from one end of the assembly to the other. 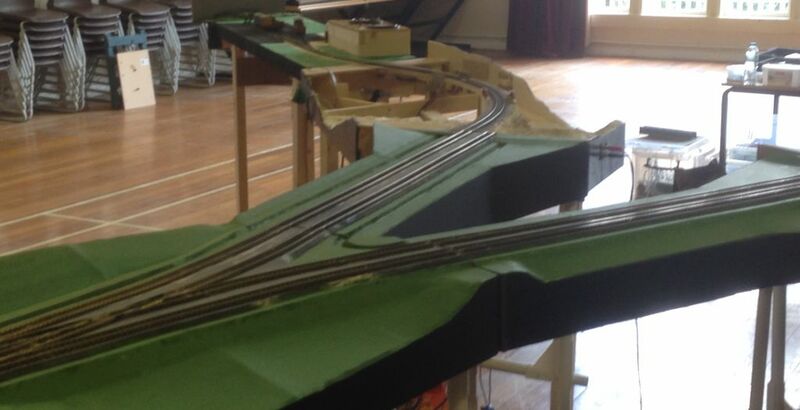 Despite a few unfortunate last-minute drop-outs we still had an impressive selection of modules assembled from contributions by 8 individuals, giving us a run of approximately 50ft from the fiddle yard exit to the end of the layout, including a short branch to some sidings with the addition of a junction module. At 10.15am, the first train, an observation carriage propelled by a Class 45 loco, suitably adorned with a custom-made “SECAG PIONEER” headboard from Narrow Planet, traversed the length of the layout without incident. 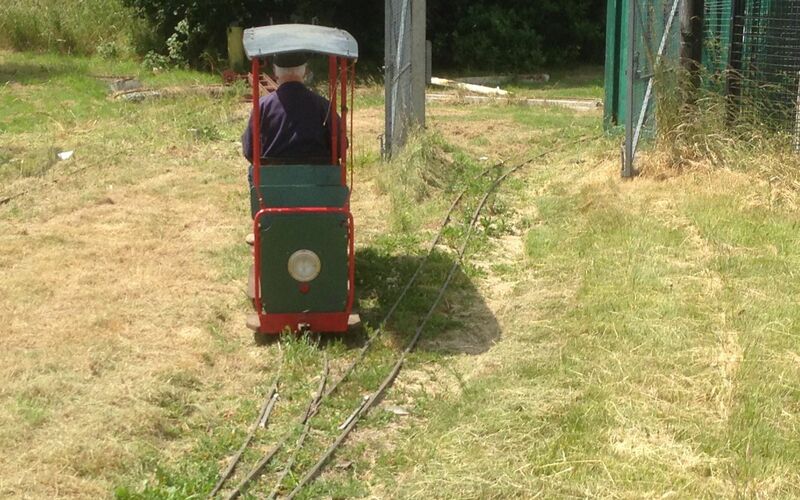 During the course of the day, a wide variety of moves were undertaken along the main line and to/from the sidings, with all members having the opportunity to run their trains. A volunteer “signalman”, utilising a very basic of red and green cards to approaching drivers, controlled movements across the junction. After lunch, a special treat was organised for the assembled crowd. The location of the meet is also the home of a 7 ¼” gauge railway, which sees occasional use, and we enjoyed a circuit of the line – taking approximately 10 minutes – with a special charter service, complete with commemorative headboard laser-etched for us by Tim Horn and assembled/painted by myself. We were in fact the first paying passengers on the line since May 2012! For those of you who asked me what Kenton looked like - you'll spot him easily in the group shot. Unfortunately my phone camera decided that actually it didn’t like auto focus much today so my selection of photos below is rather mediocre, however I know the other attendees took a range of photos which I am sure they will add here in due course. So, the key thing here is did it work. I think I can clearly say with a resounding YES that the standards are suitable, and that all present thoroughly enjoyed themselves with the opportunity. Knowing that a number of people have been monitoring our progress up to today, with a view to perhaps having a dabble in modular themselves, I present to you below our combined thoughts and views on the day. We tried traditional wired and wifi via JMRI control. We had some reliability issues and feel that some work needs to be done testing-wise to try and figure out why we had problems before considering wireless/app control to be viable. We needed more junctions, stations and passing loops. Knowing that this was an early test run of the concept, we felt that future meets would most likely contain a greater variety of functions, and larger modules, making this less of an issue. 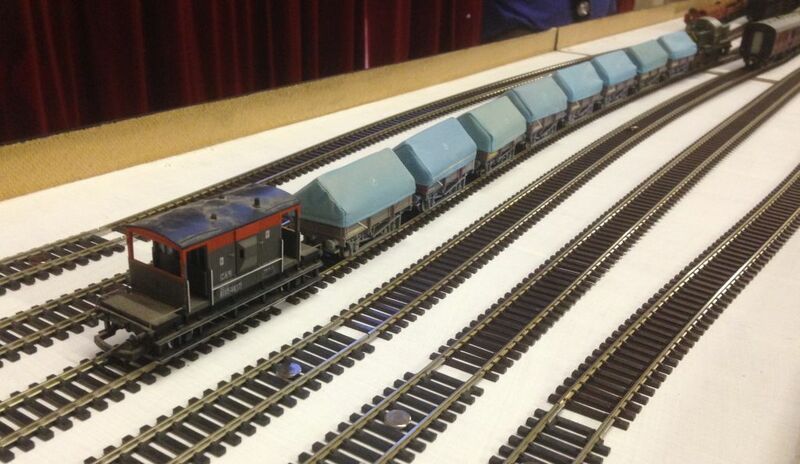 We would have liked to have had an opportunity to try double track running – however that will again become less of an issue as more modules are made available and a greater variety of opportunities for arranging them are created. Scenery is less of an issue when operating “modular” as those present concentrate more on driving trains rather than what happens to be going past on the lineside. However, for photographic purposes it will continue to be encouraged that modules are scenically complete if possible although it was recognised that “under construction” are just as valuable. My Fiesta wasn't really big enough to transport everything I needed. We come forward some years and an engineering train rounds Brockhole Curve on the embankment past the Skaledale factory. This is due to be redeveloped into a supermarket when I get round to building the kit. You'll notice that Del and Rodney have popped to pick up something that fell of the back of a warehouse to earn a few Alan Whickers down Peckham Market. The obligatory "Bus on a bridge" - except that the bridge hasn't been built yet. The world's smallest module? A 4" long "buffer stop" terminator to stop earth faults occurring. A very big THANK YOU to all who came today and made it a great success. Give me a little while to recover and I hope we can start looking to plan our next meet. Fixed that now - we haven't gone all the way to Australia! For an initial meet I think you have done brilliantly. 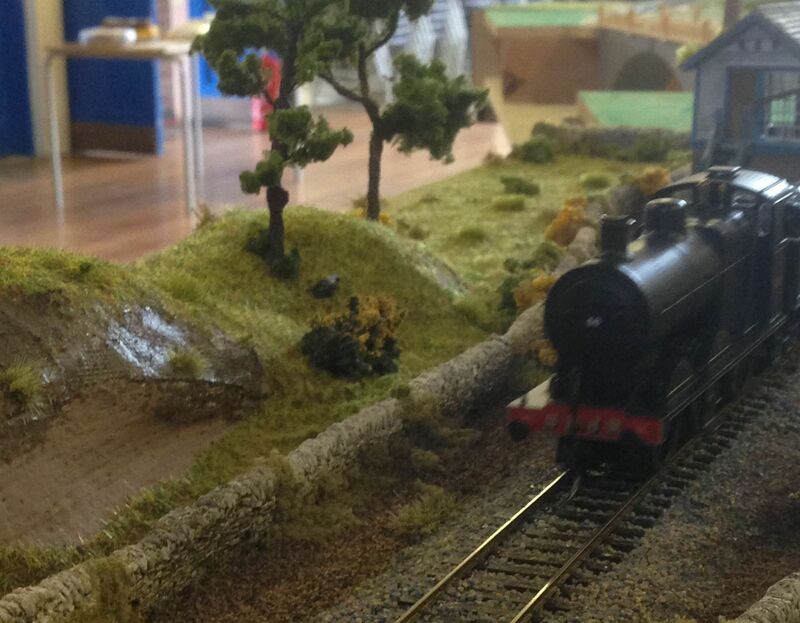 Knowing how worrying it is to plan a train set using modules built by different members in isolation, it must have been a huge relief when the first train successfully arrived. Great stuff. Well done all. A big thank you from me once again to Nut for organising the meet, and the charter train at lunch time (why do neither of my children's schools have a ride on railway?!) It was good to meet you all and see how we'd each independently interpreted the standards and what we'd created from it, i found it quite fascinating how many different styles of legs were used! I'll have to look at getting that controller app thing onto my tablet for next time! This has confirmed for me though that a couple of layout ideas I had floating in my head should be built to Dave standards, my worry with 1 of the ideas was that train length would be limited, however that didn't really seem to matter yesterday. The video upload of our ride on the MVR, with a run-by and then an almost drivers-eye view from me in the tram loco following the main train. Unfortunately 4 of us on one of those carriages was just a little too cosy! I'll have to look at getting that controller app thing onto my tablet for next time! Enginedriver for JMRI can be found on the Google Apps store (Android) or Apple Store (erm, Apple). There are several other options about but make sure they are compatible with JMRI WiThrottle. my worry with 1 of the ideas was that train length would be limited, however that didn't really seem to matter yesterday. The two limitations on train length are passing loop lengths, and storage yard. My fiddle yard will take six approx. 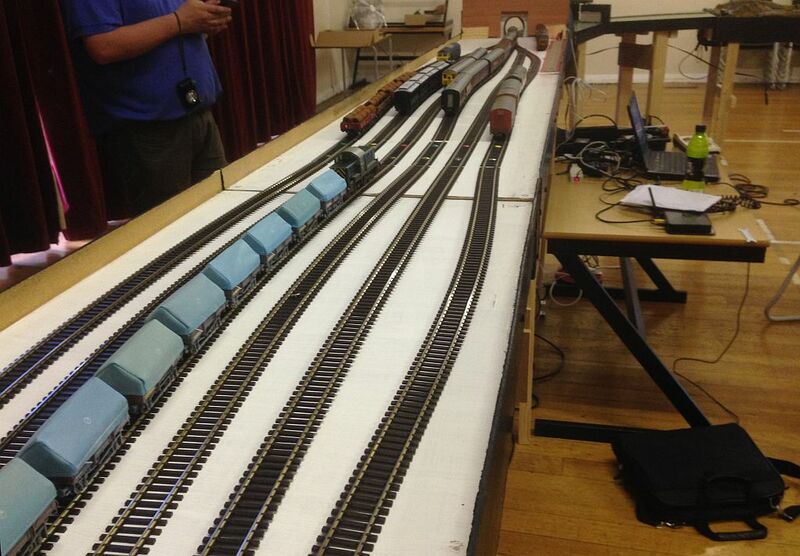 9ft (loco plus 8 carriages or 12 shorter trains, as we mostly had yesterday. Maybe something to add to the standards is a minimum requirement for passing loop length? I'm going to work on a single to double track module incorporating a station which would be 12ft ish long, giving us the same station/train length as my fiddle yard. Great stuff and sorry I had to drop out at such short notice but some things are more important than even playing trains. Good to see the operating part was noted as making the scenery development stages not an issue. My two new sets of boards are stacked in the garage and they are just basic unpainted boards with track still. I may switch them to US track for the other RM web meet this year to try out the concept o came up with for the narrow boards and then back to UK again if this takes off, only needs an hour or so per board to relay track and if I protect it it's a simple switch back too. More things to think about. I really ought to post some pics so will attempt to photograph the end result later in the week if the weather holds out around night shifts. Nice to put some faces to names too. Starting at the fiddle yard. Around Devils Bridge Curve minus bus on bridge. A view down the branch. Class 37 waits to come off the branch.. while 73 stables in the headshunt. First things first - what a great day! Definitely a success and many thanks to 'nut for the organisation and selecting such a good venue. 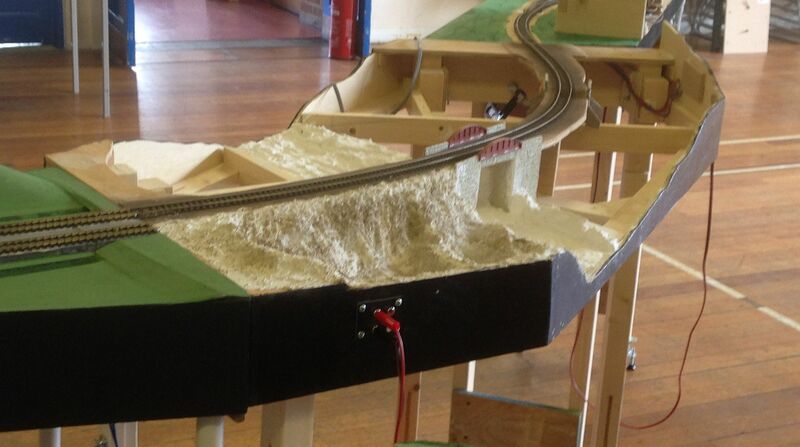 Well just had to prove that Kenton's curve worked - connecting at both ends - just ignore the (lack of) scenery - one thing we all agreed on, I think, it just doesn't matter. the most important thing is a module that can be connected to increase the size of the whole set-up. Sure scenery would be nice, it does add interest, but from an operator's perspective - especially in these eary days - it is simply not noticed. Of course in a public event that would be very different. Though even then it would show just how open the concept actually is to any participants at all levels. Well I arrived a little before 9:00 and things were well under way in raising the modules and making a start joining them together. Starting from the fiddle yard was a good idea as this way possibly the most important asset. I managed to erect Kenton's curve with ease and single handed. The slot in legs (a popular concept) working perfectly. Soon the board was sitting ready for connection to its neighbours. The G-clamps were also a near perfect solution, despite the naysayers, it took only a couple of pairs of eyes to align track and then clamp the boards to each other. The banana plug/socket system worked connecting every board. But it was a surprise that plugs come in so many different 4mm sizes! Just before 10:00 all the boards were connected and DCC power was flowing throughout the system. That in itself was a staggering achievement, slightly over 1hr before plan and with no serious problems, 6 individuals who had no contact other than the internet (RMWeb dating) had come together to prove that the very brief set of "rules" and their somewhat isolated application actually worked! But was it a total success! 1. Probably the most serious event was the loss of JMRI on Cromtonnut's PC When this went down everything came to a stand still. Falling back on the Lenz system just didn't seem to work terribly well: unfamiliarity with the Lenz controllers and I just couldn't seem to select either of my locos or even other's, the lack of handsets and the real issue of being tethered made a couple of us to suddenly loose faith in DCC! Cries of, "it wouldn't happen under DC!". Mark came to he rescue with his JMRI and PC. and we were up and running again - but only for a short period. It did not seem to be such a straightforward process to connect WiThrottle (iPhone) which continued to regularly loose connection and I had a number of runaways and strange DCC experiences where a loco intended to control didn't move then would seem to move when not being controlled. Different JMRI, different PC OS different WiFi? A backup is required. 2. 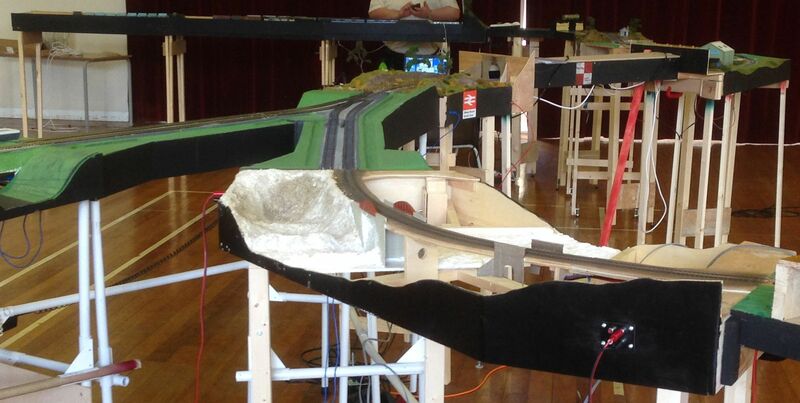 Double track testing was not possible. We need more modules of double track, junctions, loops! In fact we need more modules! 3. The one junction was a bit of a bottle-neck and it requires a dedicated full time operator and good signalling system. What we had only partly worked and operating more than one train along the setup kept failing with either too many trains (3 almost buffer to buffer) or with operators not going where they expected (of course they should be looking at the signals before taking the wrong route or going through a signal at red!) Did we need a timetable - no, not yet anyway. The free for all added to the excitement. 4. Loading gauge, era and stock: While my 2-BIL performed really well there were a couple of problems with it. 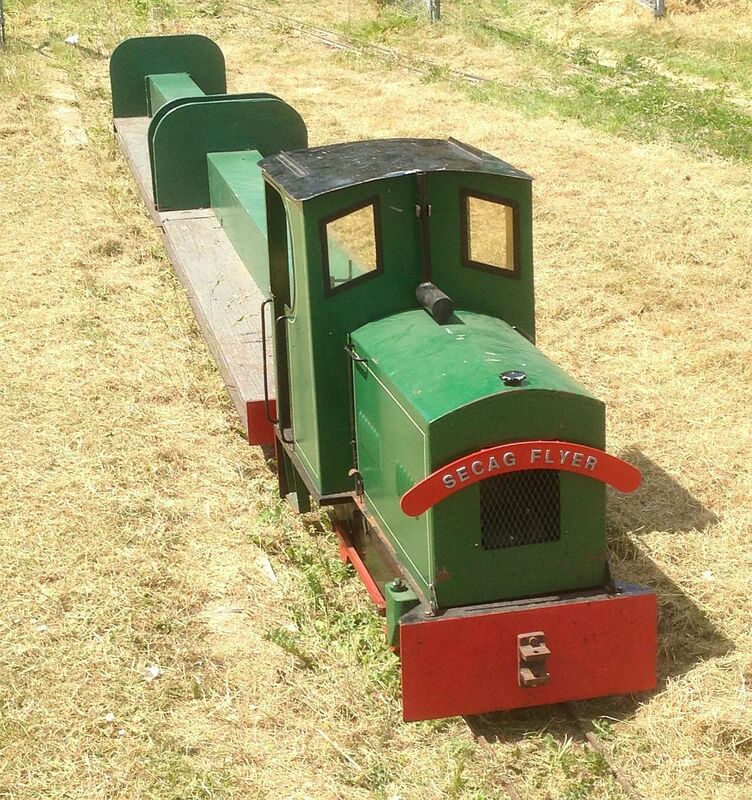 The unmotorised coach is far too lightweight and as with several coaches on the modules were subject to a number of derailments. The lightweight making some of the inter-board gap jumping a little problematic. I think the solution is more weight. Though some thought to the board gaps needs attention. Even clamping the boards tight didn't lose the gaps and one thing I noticed was that some of the gaps were smaller at the bottom of the board end plates than at the top. These end-plates have to be perfect vertical. I think we did not pay anywhere near enough attention to module height on the day. For example, I know that with my legs fully closed and feet wound in, my module stands at 2" under the spec. By the time the run had reached my module it must have already dropped by that 2" - in future we need o pay more attention to getting the height set from board to board - a few mm here and there soon adds up. 5. More loading gauge: The 2-BIL became stuck on the point rodding in Shillingstone - the 3 rail detail on the 2-BIL is good detail on the part of Hornby but there are very few 3rd rail layouts out thereto test on. It was the only train to fall foul of this problem - the VEP negotiated it without a problem. So of the passenger stock it was confined to the other side of the junction - unfortunate as it seemed to perform really well, despite my recent chipping effort. The last time this had been on track was probably 2 years ago. It had an address of 0045 (obvious, yes?) but could I get it to move? (no) The address had been set using the prodigy and I hadn't had the chance to check it on the Dynamis. but it would have been set up as the long address of 00 45 not the short address of 45. Thanks to Mark and a programming track. It was reset through JMRI. Showing the importance of having that facility available. There are bound to be address conflicts at such a meet unless there is a preprepared rosta of trains. There are bound to be some address 3 and a class 35 or two with address 35. After reprogramming it worked really well pulling its clays and a brake all over the modules - though this particular loco hate insulfrog points/crossings - anywhere and due to close pickups had a few problems with gap jumping at slow speed. Oh, the directional lights worked, well until it became confused by network resets. All in all, a very good day. We came, we assembled our modules, we ran trains, we packed up, we drove home tired after a fun day. Now we look forward to the next one with more contributing to the concept. So you lot get on and build something. Having a set height stick to level everything too before joining together might help as then you only wind one side up or down to match which would save the error multiplying as far. With the U.S. meet I set all mine to 45" before the day. Good to see all the advantages and things to live with came through too. The U.S. mob had similar Jmri problems at Exeter but we had a lot of lenz handsets so only lost a few minutes. One reason I think having my Z21 as a backup would be good for wireless as I can supply 4-5 throttles which would suit a small meet. How were the trains operated ? Did you walk along side them or stand at one or two spots and drive remotely ? Did the few scenic elements that hid the trains cause any issues or improve the experience ? Another point to note is signal strength through all those banana plugs, I metered the voltage at the end of Devil's Bridge Sidings and it was still reading a good strong 16v AC so there's no worries of loss there. And that still leaves Nuts really long leads in reserve. I found I enjoyed walking following a train, even if I wasn't the 1 driving it! Scenic elements didn't cause any issues, infact I quite liked the look of trains on curved embankments on boards like Kentons Curve and Brockhole Curve, gave it a nice sense of presence. Equally, it was nice to see trains 'fully exposed' on sections like 'Devils Bridge' so I suspect I'll keep my scenery below rail height on that one. We did have a 'measuring stick' but didn't really use it I think our inexperience and assumption that "it looks right therefore it probably is" needs to be overcome, and to be more strict about getting everything level as we assemble - although to be fair we didn't have any loose wagons roll away from the fiddle yard and end up thumping the end plate at Shillingstone at 200mph. I'm trying to figure out why I kept having issues with the WiThrottle setup - it could be any number of reasons but I hadn't really been able to test the setup much at home in the run-up to the meeting only being happy to have established connection and run a loco up and down a length of track using my phone and playing the horn from the other end of the flat. Hopefully that'll be sorted for next time - or at least having a plan B as we did this time with Mark's Lenz setup is probably essential as without a working controller base nothing will happen. I know Andy Y has seen this thread and I would expect there to be some revision suggestions to some of the standards in due course based on our findings and suggestions. Some thought it would fall at the first attempt but it seems that the enthusiasm shown so far from the participants will mean that Dave will live on. Definitely a walk alongside experience ... but untethered so you could walk around the whole setup to operate from both sides! That remote but still in control was the most pleasing part about DCC and WiThrottle. Also, I don't think we could quite trust ourselves to stand back with the expectation of derailments. But there wasn't much pushing of unreponsive trains. I would have liked to try out some more planned moves. I think an operator in charge of the FY sending trains out by request and receiving them into available roads would have been a good idea. But that would mean the other operators "stealing" control of the train to take them to the next location. For the next meet maybe. The tunnel was an interesting break though the height measuring stick did find some use in rescuing a few lost uncoupled items. It was a useful feature to have and if the setup had been bigger then it would have been used as a duck-under. Completed scenics were points of interest but not essential for this experimental meet. Functioning was the essential element and that it did. The tunnel was an interesting break though the height measuring stick did find some use in rescuing a few lost uncoupled items. It was a useful feature to have and if the setup had been bigger then it would have been used as a duck-under. Actually it was used as a 'duck under' - hence the name of Dog Tunnel, Duck Or Grouse - several times during the meet, and it seemed easier to make than a lift-out section Originally it was going to be scenicked on top but the general consensus was that it's fine just painted black to provide a scenic break as you mention. I think, therefore, I will unscrew the top and put a couple of hinges on it so that it can be opened in case of lost or derailed wagons needing access. Much easier than undoing six screws particularly if nobody thought to bring a big enough screwdriver! OK be proud to be Part of the Britmod-OO (Dave) Modular group.. Put your sound on full and stand to attention with hand on heart. For here is the Video of the day. I do hope Andy York sees that - it really needs to go into one of the online BRM newsletters with an accompanying article. Steve, excellent, and well edited! Very nicely done Steve, no clear shots of Kenton's face! Looks like an excellent event. Modular layouts are a brilliant idea, and it's really good to see it starting to get some traction here.